Some people consider pufferfish, also known as fugu, a delicacy because of its unique and exquisite flavor, which is perhaps seasoned by knowledge that consumption of the fish could be deadly. Now, researchers have identified the major compounds responsible for the taste of pufferfish, minus the thrill of living dangerously. They report their results in ACS' Journal of Agricultural and Food Chemistry. Pufferfish get their name from their ability to inflate to a much larger size when threatened by predators. But if that defense mechanism fails, the predator may not survive long after its meal: The liver, ovaries, eyes and skin of most species of pufferfish contain tetrodotoxin, a potent neurotoxin. Although specially trained chefs can prepare fugu that's safe to eat, Yuan Liu and colleagues wondered if they could reproduce the flavor of pufferfish without the life-threatening toxin. 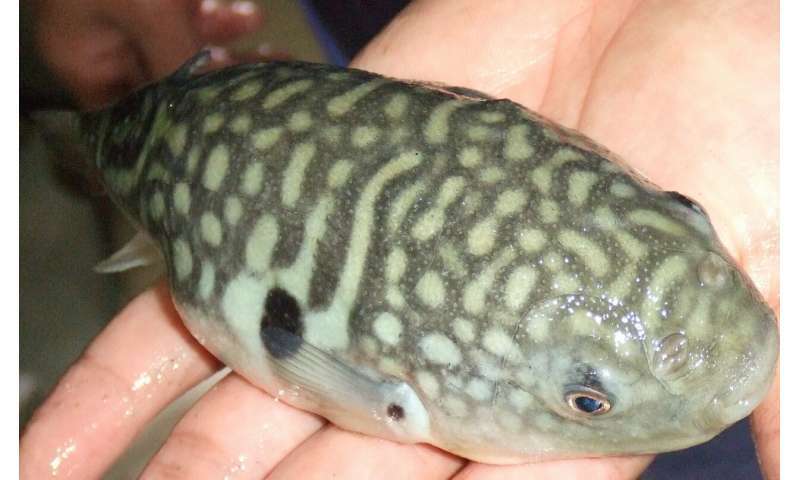 The researchers analyzed the key taste-active compounds in Takifugu obscurus, a species of pufferfish found mainly in the East and South China Seas. First, the team ground up pufferfish muscle tissue and cooked, filtered and centrifuged it to produce a liquid pufferfish extract. They then analyzed the extract and found amounts of 28 potential taste compounds, such as free amino acids, nucleotides and inorganic ions. Taste tests with trained panelists revealed that 12 of these compounds, when added to water, best simulated the flavor of pufferfish, which involved strong umami (savory) and kokumi (mouthfulness) components. When the researchers added two flavor peptides they isolated in a prior study, the imitation pufferfish extract tasted even more like the real thing. What gives parmesan cheese its unique taste?